The darkness of the first season is also turned up massively – the Maniax take their cue from The Dark Knight, with a school bus full of cheerleaders at threat. This, of course, allows Ben McKenzie’s Jim Gordon to be even more of a hero in comparison… although the GCPD will never be the same after the events of the final act. 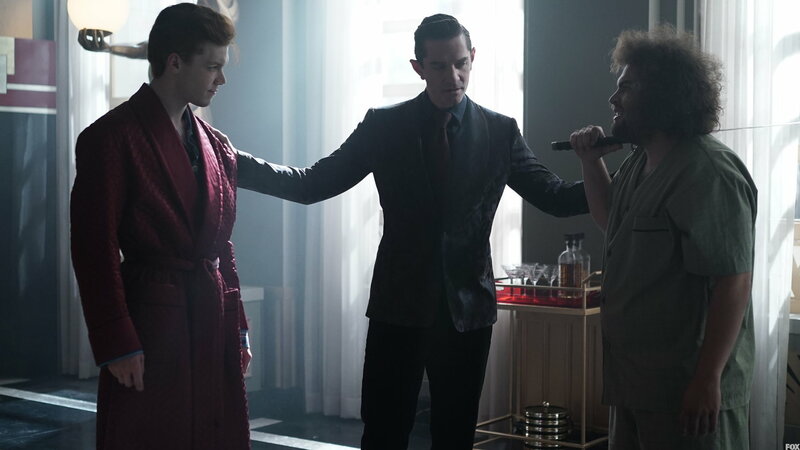 No sign of the Penguin this week but some good moments for Mr Nygma, with Cory Michael Smith getting a chance to display a very different side to the future Riddler as his dual personality becomes more pronounced. Erin Richards’ Barbara looks as if she’s being sidelined initially, but has a key role to play towards the end of the episode, and Donal Logue’s Harvey Bullock is similarly key when he does appear. As for Bruce Wayne and Alfred, their relationship takes a major turn, with Lucius Fox now deciding which side he’s on – and although the scene between Sean Pertwee and Chris Chalk was a good one, it did slightly unbalance that end of the episode.